SEOUL, Dec. 6 (Yonhap) — Tottenham Hotspur forward Son Heung-min has scored his 100th goal in his European career, becoming the second South Korean to reach that milestone. 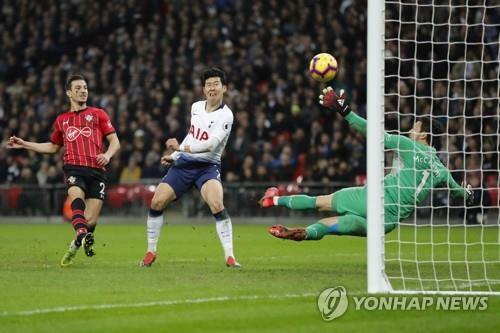 Son scored Tottenham’s third goal in his club’s 3-1 win over Southampton in their English Premier League (EPL) match at Wembley Stadium in London on Wednesday (local time). With Tottenham leading 2-0, Son redirected Harry Kane’s cross in the 55th minute to bag his 100th career goal. This was also Son’s fourth goal across all competitions this season. In the EPL, he has two goals in 10 matches. Son is now the second South Korean to score 100 goals for European clubs. Cha Bum-keun, who had stints with Frankfurt and Bayer Leverkusen in the German Bundesliga in the 1980s, had 121 goals across all European competitions. Son, who made his pro debut with Hamburger SV in the German Bundesliga, scored his first goal in 2010. He then netted 20 goals for Hamburger and scored 29 goals for Leverkusen before moving to Tottenham in 2015. With the London club, Son now has 51 goals. Against Southampton, Son started as a left winger in Mauricio Pochettino’s 4-2-3-1 formation. The 26-year-old almost scored his 100th goal just three minutes after the kickoff. Son fired a volley off Kieran Trippier’s headed pass, but his effort rang the post. In the 31st minute, Son’s middle-range effort was tipped away by Southampton goalkeeper Alex McCarthy. But Son finally found the net in the 55th minute. Kane delivered a fine cross from the right side of the box, and Son tapped it home to give Tottenham a 3-0 lead. Southampton got their consolation goal in added time as Charlie Austin’s right-footed strike hit the net. Son played full time.